While most pieces of jewelry are made to last, sometimes with normal wear they may need to be repaired. Prongs may move or get worn down, a clasp may break, or a diamond may become loose or fall out. 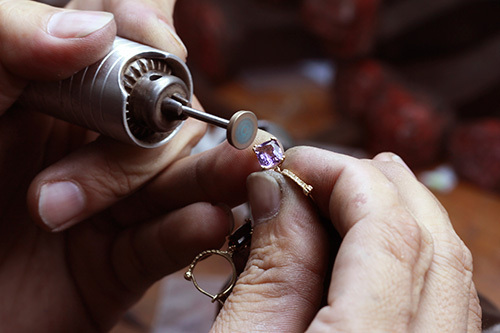 Our jewelry repair services are performed by skilled bench jewelers. We are capable of simply replacing a diamond that has fallen out all the way to repairing and restoring family heirlooms to their original quality and beauty. Give us a call, or stop in and let us help you ensure your jewelry is wearable at all times! This business is absolutely incredible. I was lost in the process of selling my wedding ring and ready to give up. I was going to settle with a **** broker/Jeweler. During my research online, I came upon the MJ Gabel website. I researched them thoroughly and found nothing but positive reviews. Next, I contacted Matt, who professionally taught me about the value and how it’s determined. Next, he let me know my options if I wanted to utilize their services. I thought about it for a few days, then contacted Matt and signed up. It is very difficult to trust someone out of state with an expensive piece of jewelry, but they have every base covered. Matt walked me through every step and scenario once they received the ring, all the way through sending me a check. Please, I know it’s natural to hesitate, but this Company is honest, professional, and works very, very hard to get the utmost value out of your jewelry. MJ Gabel worked to get me thousands more than a local offered. I would and will recommend them to the highest degree, just like their service! Never be pressured to take any offer, even if you have already shipped your jewelry. A company must ship back your jewelry if you do not accept the offer they present you.